If you've had kids, been a kid or even just been around kids you'll know about the life-changing moment when that child becomes a teenager. Their mood and behaviour changes as do their interests. Unsuprisingly, animals go through similar changes, although they won't slam the door in your face when you don't let them go to the mall when they want. These changes start when your kitty is between 13 and 20 months old. Cats that were quiet, cuddley and shy may transform into playful, rambunctious and may even be a little bit of a scratcher, while other high-energy cats may begin to mature and slowly calm down into lap cats. If your adolescent is displaying signs of aggression, it could mean your cat develops biting or scratching habit towards humans, which might be a bit of a risk to your family, specially if you have children in the house. This can be controlled with consistency. Use a clean spritzer bottle to spray your kitty with water whenever he or she bites or scratches. This will irritatate them so much that they will stop. During this time be warned that if you have an outdoor cat, to be prepared for your cat to come home with a few scratches and battle scars. He or she may be starting fights with other cats in the neighbourhood, and this will be much harder to manage and stop. 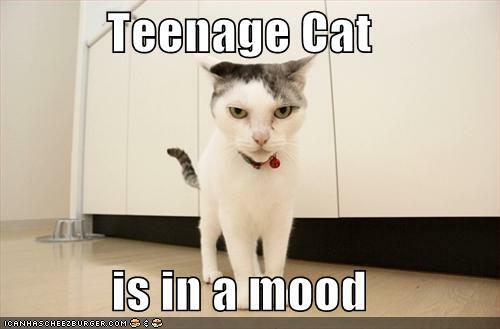 However as your kitty comes into adulthood they are sure to calm down. Treat any wounds carefully and if the injuries are serious take your cat to the vet. Be warned that during your cat's adolescence, your furniture may be about to recieve some injuries of their own. Cats increase their levels of scratching furniture to leave scent marks so that it is identified as his or her property. The spray bottle technique also works wonders for this. However if your cat is possessive he or she may also be marking territory by urinating. This is a much tougher problem to deal with as the smell of cat urine is hard to get rid of. If there are particular places your cat has been eyeing off, spray it with vinegar as the smell will deter your cat from urinating there. Adolescence is also the time your kitten reaches sexual maturity, signifying it is time for your cat to produce his or her own little kittens. However it is advisable to spay your kitty as backyard breeding can be quite hard on your cat. It is easy to be able to tell if your female cat is in heat as she will be screaming and rolling around. This usually lasts a week! If they are not spayed, try and keep her indoors at this time so she doesn't fall pregnant. So that both you and your cat survive their adolescence, try to get them to engage in puzzle toys, daily play time and as many engaging activities as possible to give his or her time to burn extra energy. It will also give him or her the opportunity to hunt, stalk and chase-all instinctual behaviours he or she should learn to control.